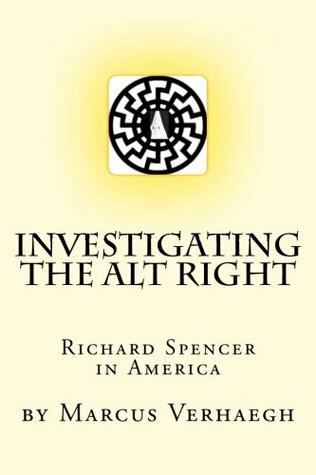 My first clue that something was wrong about this book was the odd subtitle: Richard Spencer in America. What does that mean? As opposed to, say, Richard Spencer in Africa? Richard Spencer in Space? I suppose the whole thing is supposed to sound ominous and significant, like one of those dreary CBS Special Reports from the ’60s, such as Deadlock: The Railroad Dispute, Cigarettes: A Collision of Interests or D-Day Plus 20 Years: Eisenhower Returns to Normandy. To me, it just reminds me of one of those ’60s LPs, like Magic Bus: The Who on Tour. Then, I noticed that it was self-published. Now, I’ve self-published a few items myself, and the whole DIY thing has a fine tradition — Baudelaire! Lautreamont!, etc. Why let a small literary clique decide what you “ought” to read — especially one as (((alien))) as our own? Still, how bad must a book be, if a university professor decides to not even submit it to a reputable, peer-reviewed outlet, but essentially run it off on a mimeograph machine in his basement and then hawk it on the streets? How does that further his career? How does that impress the tenure committee? His thesis, if such there be, seems to be this: White Americans feel resentment towards, and fear of, their displacement through unlimited Third World immigration, and they are correct. However, Spencer serves, willingly or not, as a “lightning rod” to attract all manner of accusations of anti-Semitism, neo-Nazism, KKK-ism, etc., which serves to unfairly tar the legitimate concerns of the White masses. When the author says midway through — in a lame attempt at channeling Hunter S. Thompson — “I had now spent two whole days on the trail of the alt right,” we certainly believe him. Though only about 125 pages, the real content is much less, as throughout the work the author avails himself of the strategy of cutting and pasting huge chunks of quasi-relevant stuff he’s found on the internet, and then moving his argument forward by appending a few lines of commentary, itself usually afflicted by several handicaps. The worst and most all-pervasive is a curiously idiolectic style of language, as if the author had spent his childhood hidden from the secret police and learned English from snatches of VOA broadcasts, supplemented, in Chomskyian fashion, by his own grammatical leaps of faith. Call me a bigot, but from the name and the language I was certain the author must be a furriner, and that this was another flaw in the self-publishing method, lack of adequate proofreading; but then various statements seemed to indicate he was born in the upper Midwest and considers himself a solid Heartland type. Still, I can only imagine how awful it must be to have this guy as a professor, and in this he serves to moderate “Alt Right” claims that immigrants from White countries might be OK, but not those Indians. There’s also a strange kind of “as a Catholic, I am at home with true conservatism but can’t pretend to understand these curious Protestants” that gurgles underneath like a basso obligato performed by Ignatius Reilly’s pyloric valve. Another technique, related to the linguistic conundrum, is the excessive use of commas, which must add at least a page or two; unless this can be attributed to the author learning English by reading David Hume. He occasionally hints at endorsing the idea of Spencer as a CIA plant, but lacks the honesty, or guts, to actually say so. If you like this kind of stuff, you’d be much better off reading Miles Mathis directly; he writes comprehensible, even rather snazzy, English, and his essays are free. There is a fitful attempt to leverage his supposed philosophical acumen in the area of Heidegger in order to discuss the question of whether groups have a shared reality; but true to form, these attempts are confusing, convoluted and incoherent. If you are interested in such questions, cartoonist Scott Adams, of Dilbert fame, does far better than this supposed professor. The one-time Paradisiacal fields are completely exploited and plundered like a wheat-field in which a thievish horde of apes has taken up residence. Our bodies are infected with a mange which despite every kind of soap remains udumu-ized, pagutu-ized and baziat-ized [that is, made ape-like]. Never has human life been as miserable as it is today — despite all its technical advancements. Devilish human beasts oppress us from above, slaughtering millions of people in unconscionably murderous wars conducted for the enrichment of their personal money-bags. Savage human beasts undermine the pillars of culture from below. . . . What do you want with Hell in the Beyond?! Isn’t the one we are living in now, and in which we are now burning, terrible enough? Then too this issue is intertwined, with garbage, with feces, with the most odious self-hatred imaginable — and now, also with the simple issue of controlling non-western immigration. To sell to the white Westerner, he was not losing out through mass Third World immigration, required making questioning of open borders dogma, a kind of taboo akin to the taboo on shitting in public. So, then, investigation of ‘white nationalism’ proves difficult, as it centers around a simple idea of border control that the establishment — the Left-liberal post-Protestant establishment — has decided to align with rectal cancer and the Lord of the Flies. No one should read this book, and the professor, as the real Hunter Thompson suggested regarding Hubert Humphrey, should be stuffed in a bottle and set adrift in the Japanese current. Possibly recommended, however, for libraries with collections of political humor, assuming they have some money left over in the budget and need to spend it before the end of the fiscal year. I’ve even heard of at least one case where a professor was fired for “wasting his time” writing a book on his hobby, mountain climbing, when he should have been scribbling away in his own field. 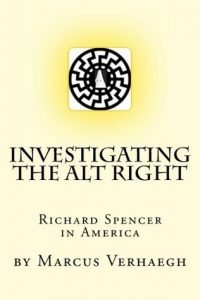 Published: February 26, 2018 | This entry was posted in North American New Right and tagged book reviews, Investigating the Alt Right, James J. O'Meara, Marcus Verhaegh, North American New Right, originals, Richard Spencer, the Alternative Right, white nationalism. Both comments and trackbacks are currently closed. What is the deal with Miles Mathis? It took you 38 pages to realize this? I applied the Principle of Charity as long as I could. Good lord. From the single passage you quoted, I must commend you for having the patience to read that mental diarrhea, even if it is only 125 pages. I suppose it’s normal for any movement gaining significant traction to dredge up some whackos along the way.